← Shred those Holiday pounds away. Who else out there is a soup fanatic? I love it and make it all the time. I make it from scratch or just eat it from the can. I don’t want to mislead anyone, I am not a super great soup maker. I can only really make one soup…vegetable soup where you throw random veggies in a pot and hope it tastes good in a few hours. That’s the kind that I make. I look forward to attempting actual recipes, but for now, this is what I do! I think that the most attractive part of this soup is its cost (you will spend around $12.00 for about 10-12 servings) and the calorie content is pretty low. Don’t ask me for specifics because I can not give that to you. 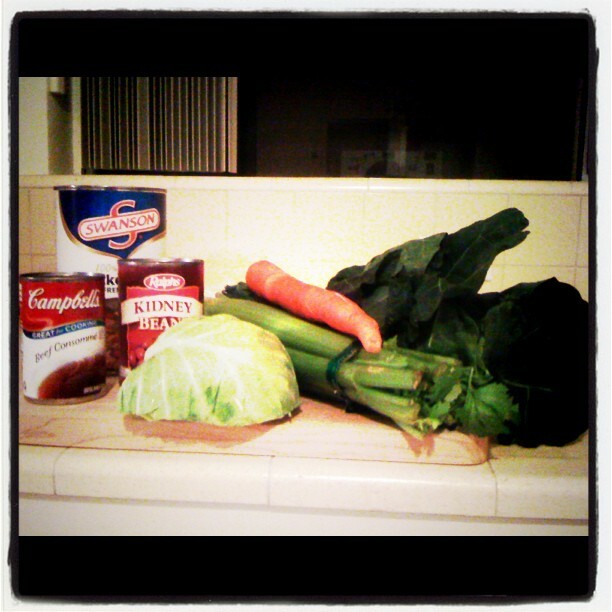 But, I did sort of rip my idea from The Cabbage Soup Diet when I was feeling like going on a weight loss cleanse; so it cant be high on the calorie scale! I have amended it slightly but those are its roots! 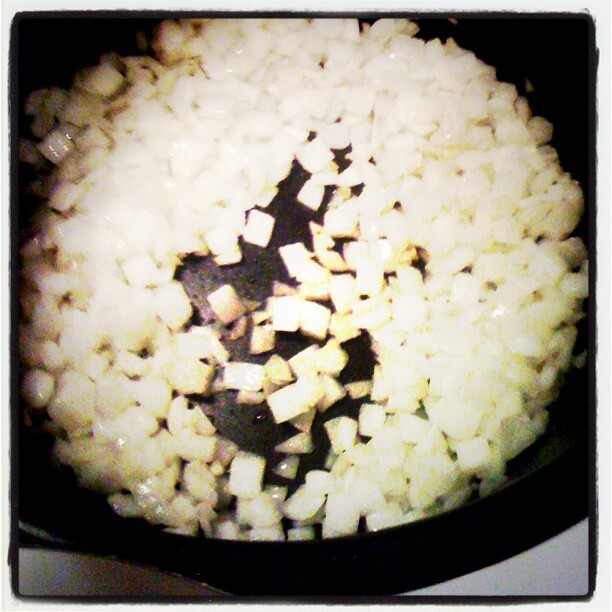 First step, chop up those onions and garlic cloves. Toss them in a large saucepan with the olive oil. 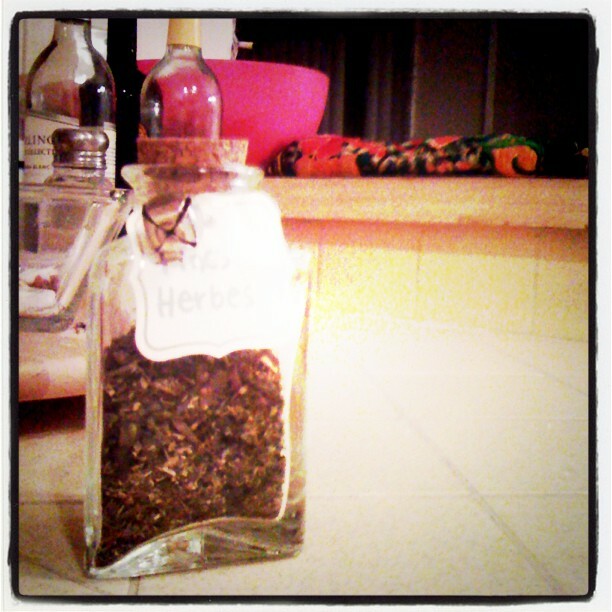 Sprinkle in a pinch of fines herbes. This is super important! It really helps with the flavoring of the soup as we are not adding a ton of salt. I already had some at home that my mom and I packaged one Christmas. See! There I am (with blonde hair and really good looking) at our herbal packaging plant aka. the dining table. Anyway, you are going to be sauteing this on medium heat for about 15 minutes. The goal is to get it golden brown and caramelized. I usually hike the heat up to medium-high after about 10 minutes. See what works for your stove to get to the caramelly goodness. I am going to stress this again. Please be patient with this step. 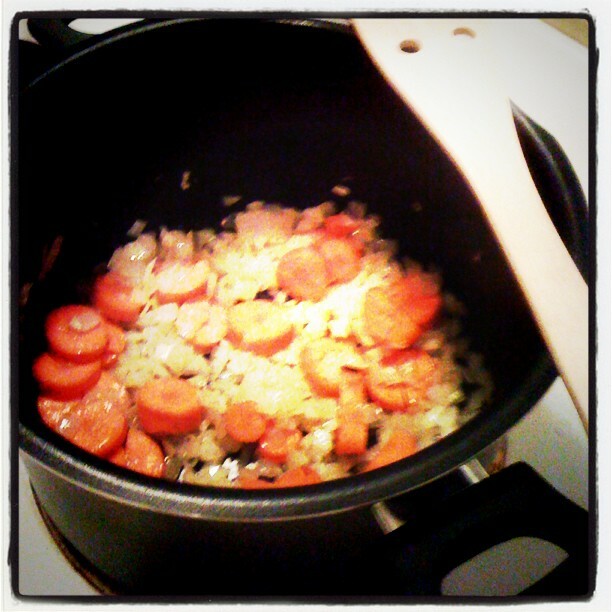 It is crucial to making the soup flavorful! I don’t add salt because it truly doesn’t need it if this step is done correctly. Add some black pepper if you desire, though not necessary. After that has been nicely softened, add your can of beef consommé. Don’t add water, just the contents of the can. Throw in another pinch of fines herbes. 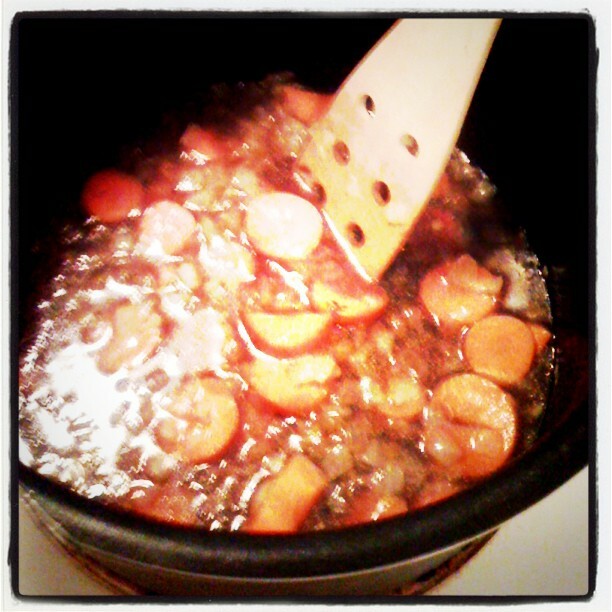 Let this come to a boil and then lower heat to simmer. 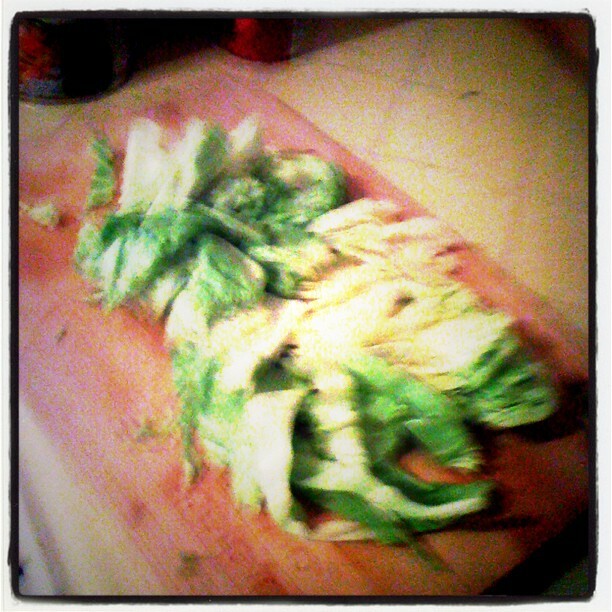 While this was heating up, you were super busy chopping up that bunch of celery, weren’t you? I actually hate celery unless it is cooked in a soup. 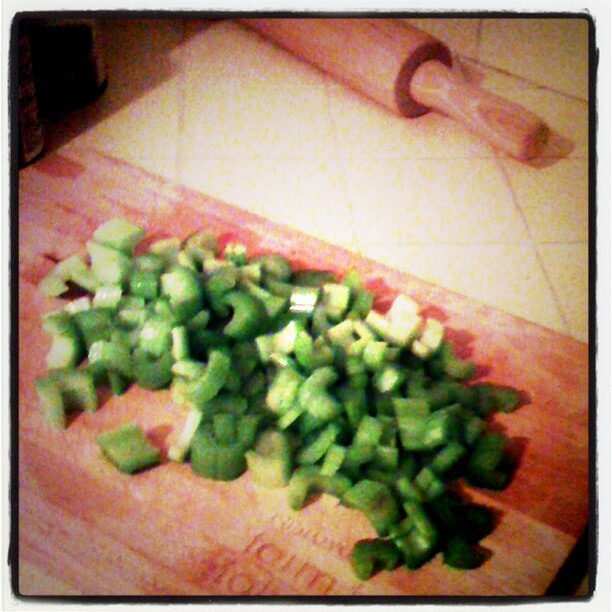 So when I do celery in soup, I do a lot of it! Add this to the consommé mixture and let it come to a boil, then lower to simmer as you did when it was initially added. 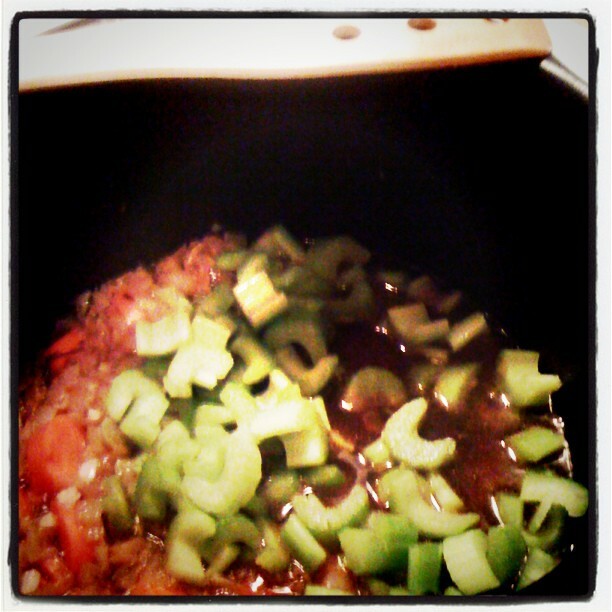 Once this has been simmering for a few minutes, go ahead and add that chicken stock. Also add 50 oz of water (just fill the stock can back up and dump it in). Bring this to a boil. Ah, why not…throw in another pinch of fines herbes. 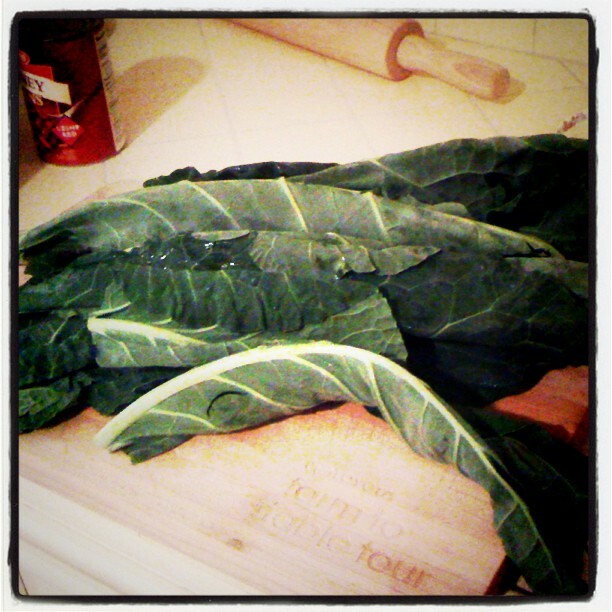 While this is cooking away, you are chopping up those collard greens (or kale if you had the desired ingredient) and cabbage. 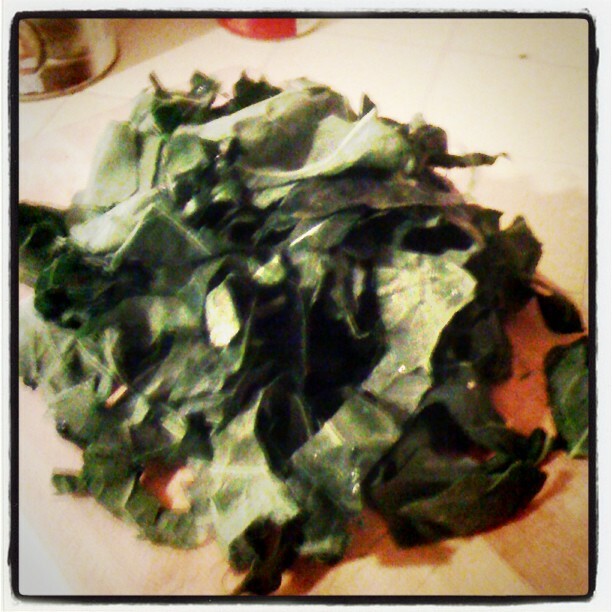 I really recommend that you really chop away at those collard greens. If the chunks are too big, they are pretty difficult to eat! As you can see from my photo, I didn’t do a stellar job at following my own rule. Add these greens to the soup pot with care. 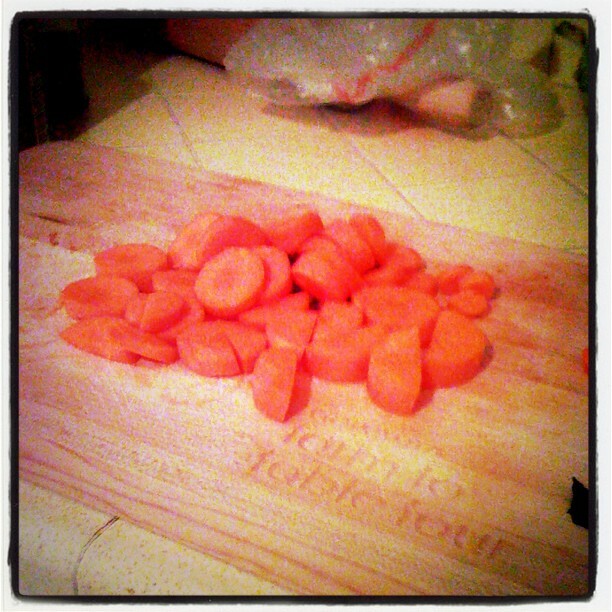 You will add it in small handfuls while pushing it down with a spoon. Do this until all are in the pot. 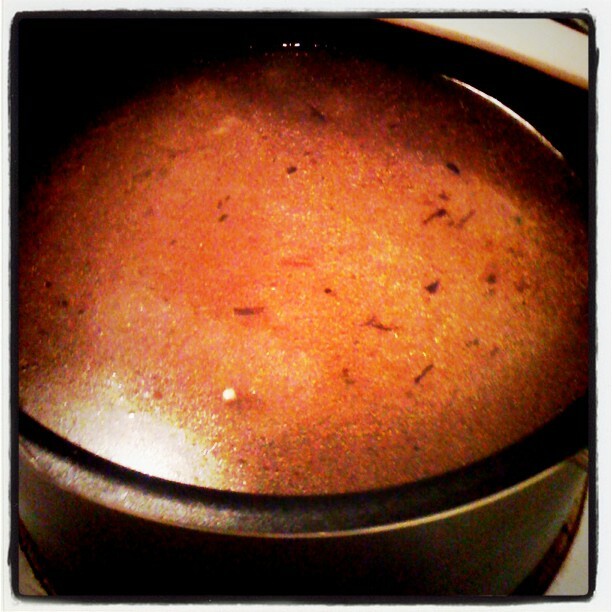 Bring back to a boil and then simmer. You can eat this soup the same day that you make it, but I would recommend letting it simmer complete for at least 40 minutes. 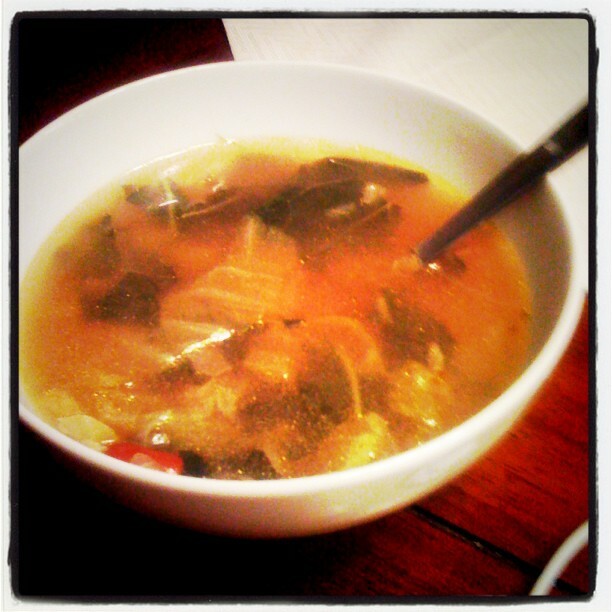 Of course, as with most soups, it is much better the day after. If you live alone like I do, this is a great soup to eat off of for 3-4 days. Storing the whole pot in the fridge makes it easiest to grab it and throw it on the stove for quick reheating (I don’t recommend microwaving in general). Enjoy (how can you not for $12.00?)! !